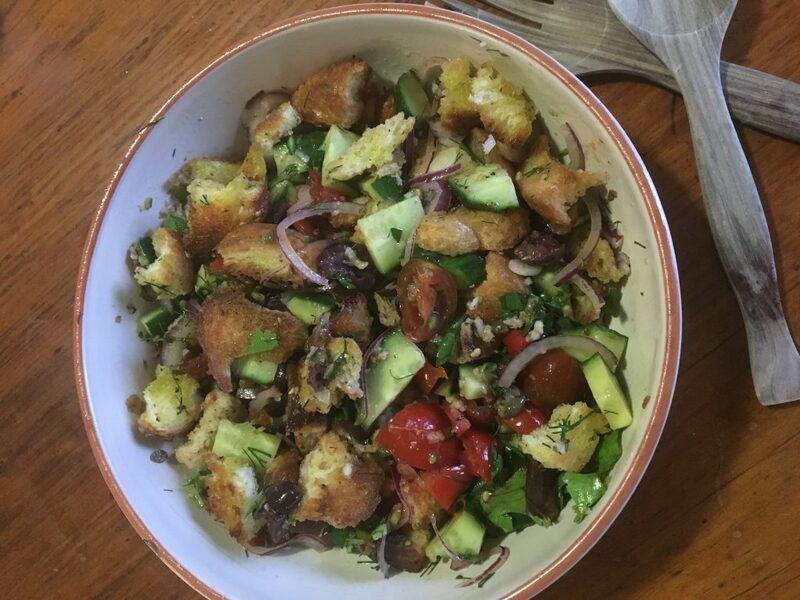 This salad is a classic Tuscan dish that is a great way to use up stale bread. It is refreshing in summer, and like many foods if you start with good quality ingredients like juicy tomatoes and good quality bread, it is delicious. You could have this salad on it’s own or as a side. Thinly slice the onion and place into a bowl, then sprinkle with the salt and a few good splashes of red wine vinegar. Massage with your fingers and allow that to sit while you make the rest of the salad. Soaking the onion helps to reduce the burn from it. Tear the bread into bite size chunks and sprinkle with olive oil and a little salt. Spread it on an oven tray and then place into the oven. Keep an eye on it as you make the rest of the salad, and give it a shake/stir so that it gets evenly browned. It should take about 10-15 minutes to get golden, at which point remove it from the oven. Start assembling the rest of the salad into the bowl with the onion. If you choose to use the anchovy then chop it up very finely before adding to the vinegar an onion, then stir it around a bit more. Add the tomatoes, olives, capers, cucumber, lettuce and herbs. Sprinkle the sumac and pepper over the top, then drizzle with the olive oil. Mix it all together. 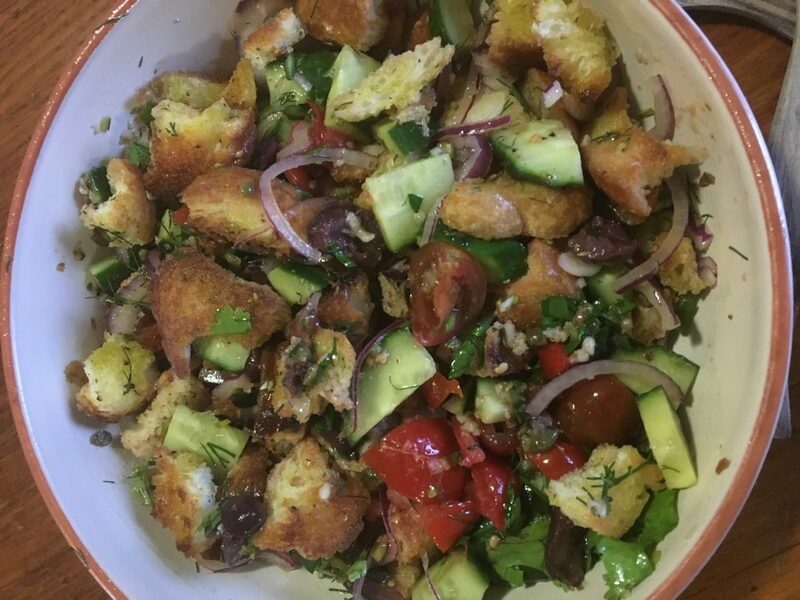 When the bread it golden, allow it to cool for a minute then stir through into the salad.